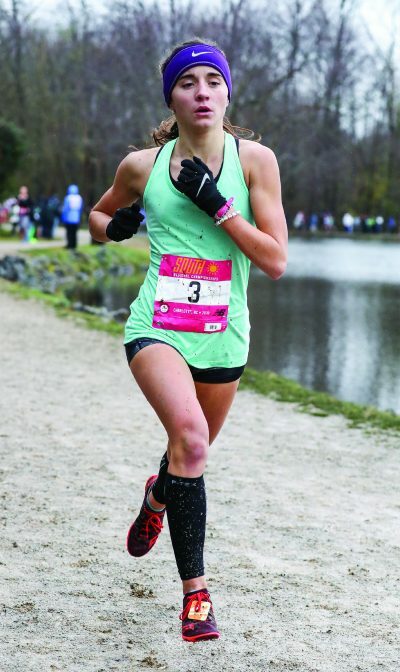 Riverview runner Alyssa Hendrix earned a return trip to the Foot Locker Cross Country Championships National Finals. While most people were relaxing or recuperating from a big Thanksgiving dinner on Saturday, Nov. 24, a young lady from Riverview was outside in cold weather running along at a quick pace. Now, she heads to San Diego for a crack at a national championship. Alyssa Hendrix, a junior at Riverview High School, ran a 3.1 mile wet, muddy course in 37 degree weather at McAlpine Greenway Park in Charlotte. Hendrix was negotiating the 5,000-meter course in shorts, knee-high socks, and mittens while most of us were enjoying the balmy tropical weather, or chilling out on the living room couch, back in her hometown in Hillsborough County. Hendrix’ conditioning, practice and dedication paid off with a 7th place finish at the Foot Locker Cross Country Championship South Regionals. She earned another automatic invitation to the National Finals. This is the second year in a row Hendrix has qualified for the finals. She finished in 18th place in last year’s National Finals. The top 10 boys and girls from races all across the country qualified to compete with runners from the South, Northeast, Midwest, and West regions. The finals are Saturday, Dec. 8, at Morley Field, Balboa Park in San Diego. The championship race will be webcast live at www.footlocker.com. The Nov. 24 race of Hendrix is also available at the same website. Hendrix’ 7th place qualifier was a mere 12 seconds off the first place time for the girls in Charlotte. The winner was London Culbreath of McKinney, Texas, who posted a time of 17:12.9. Cruz Gomez of Donna, Texas, won the boys’ division with a time of 15:04.8.